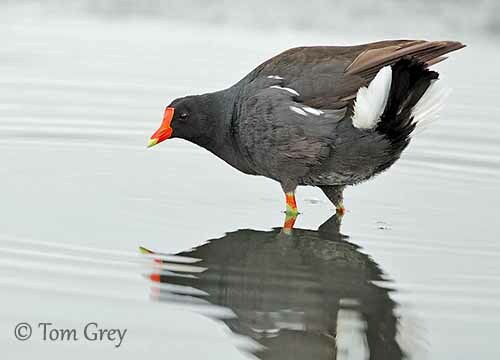 The Common Gallinule was formerly considered the same species as the Common Moorhen, but it is now a full species since July 2011. This species is commonly seen in the marshes of North and South America. The split was accepted based on morphological differences between the two species, and especially the larger, square-shaped frontal shield of the New World species. The shield is smaller and more rounded in the Old World gallinule. There are also drastic differences in vocalizations, very useful for good identification. The Common Gallinule has stable or even increasing populations according on the range, and the species is not currently threatened. 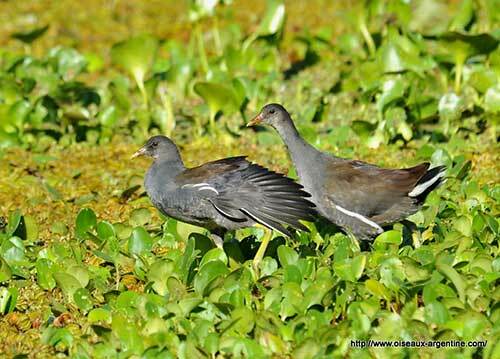 The Common Gallinule adult of nominate race has dark slate grey upperparts with olive-brown wash on middle of the back and rump. The underparts are dark grey. There is a conspicuous white line along the upper flanks. The white lateral undertail-coverts are often displayed while the bird is flicking its tail. The bill is red with yellow tip, and extends upwards to the forehead, forming a large, square-shaped, red frontal shield. The eyes are red to red-brown. Legs and feet are yellow-green or yellow, with red-orange upper half of tibia. Male and female have similar plumage, but male is larger than female. The juvenile is duller and paler than adults. It has mostly greenish-brown bill and small frontal shield. The eyes are brownish. Legs and feet are olive-grey. 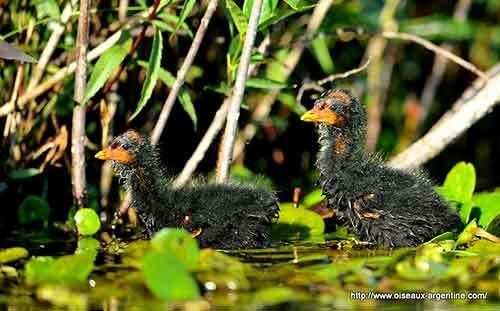 The Common Gallinule has seven subspecies which differ by size and coloration of upperparts. G.g. sandvicensis from Hawaiian Islands has larger frontal shield. G.g. cachinnans occurs in SE Canada and USA, through Central America to W Panama, and also Bermuda and Galapagos Islands. The northern populations winter S to Panama. This race has longer bill. G.g. cerceris occurs in Greater and Lesser Antilles. This one has blacker upperparts, larger bill and larger feet than nominate. G.g. barbadensis is found in Barbados. G.g. pauxilla is found in E Panama, N and W Colombia, W Ecuador to coastal SW Peru and N Chile. This one is smaller than “cachinnans” and with more grey-brown upperparts. G.g. garmani occurs in the Andes of Peru, N Chile, Bolivia and NW Argentina. This race resembles nominate but it is larger and darker, with more uniform plumage. G.g. galeata (described above) is found in Venezuela, Trinidad and the Guianas, S through Brazil to N Argentina and Uruguay. 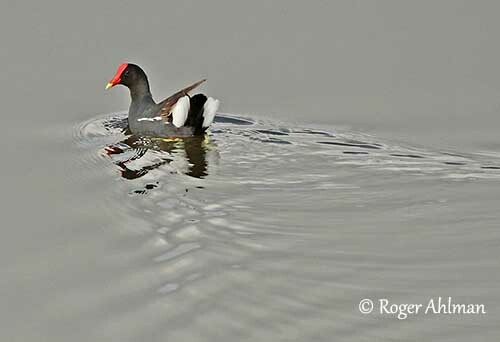 The Common Gallinule frequents freshwater marshes with some areas of open water, and ideally with some open ground and some dense vegetation along the shores. It can be seen on reedy ponds, ricefields, reservoirs and flooded grasslands. It also occurs in brackish waters in Galapagos Islands, and sometimes in mangroves in Puerto Rico. This species usually avoids saline situations. It is often seen in lowlands, but it may reach 4200 metres of elevation in Argentina. 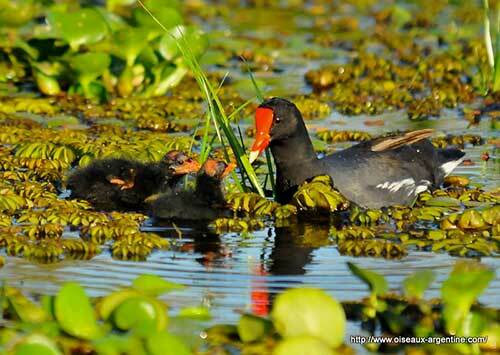 The Common Gallinule is known for its weird cackling and giggling noises. It often repeats a wide repertoire of clucking and chattering calls. It may produce long series ending in whining notes “kukkuk-kuk,kuk,kuk, peeh peeh peeh”. 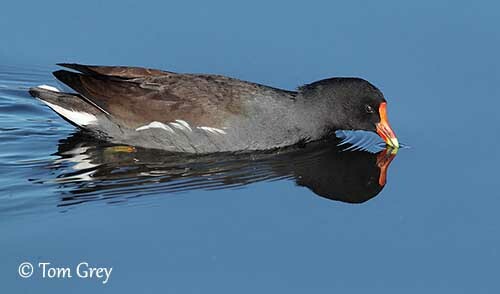 The Common Gallinule is omnivorous. It feeds primarily on plant material including leaves, stems, seeds from several aquatic plants, and fruits and berries from terrestrial plants. But it also takes invertebrates such as insects, spiders, earthworms, snails and other molluscs, and tadpoles. It may sometimes take carrion and eggs of other bird species. It forages by swimming, but it also walks on land and climbs through the vegetation around the shores. 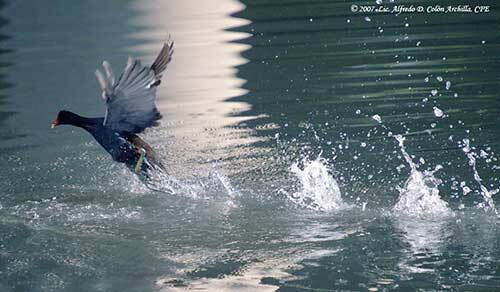 In the water, it sometimes dips the head below the surface, or performs upending or occasionally dives. During the breeding season, they perform ritual displays. The male chases the female on land. Then, they stop and bow deeply, before to preen each other’s feathers. Other displays show the birds lowering the head while raising the tail, in order to display the white undertail-coverts. They are monogamous and territorial, and fights between rivals often occur in territory defense. The eastern populations of North America are migratory and move S to their wintering areas along the coasts and S to Panama, West Indies and probably South America. They return to their breeding grounds in April/June. The South American populations perform some seasonal movements. 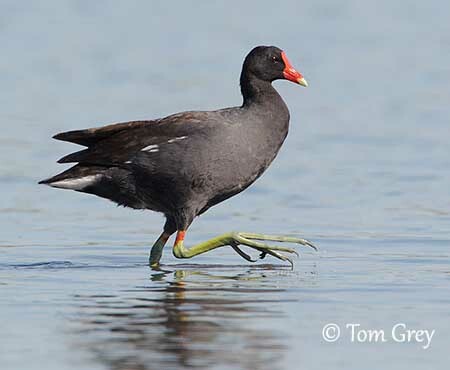 The Common Gallinule has swift, direct flight with powerful wingbeats. The breeding season occurs in April/June in North America, in December/January in Panama, between July and September and during the rainy season in the Andes. 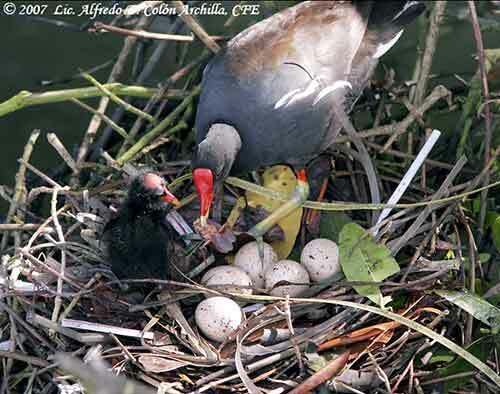 The Common Gallinule produces 1-2 broods per season, and several replacement clutches occur if the previous broods are lost. Both adults build the nest, a platform made with twigs and aquatic vegetation, or sometimes a wide, shallow cup with a ramp leading down to the water, made with similar materials. They often build a second nest in the vicinity for resting, sleeping or brooding. The nest-site is situated in marshes over shallow water, but also on the ground or in dense vegetation near water. In open water, it is anchored to the vegetation. The female lays 5-8 creamy-white eggs with brown speckles. Both adults incubate during about three weeks. 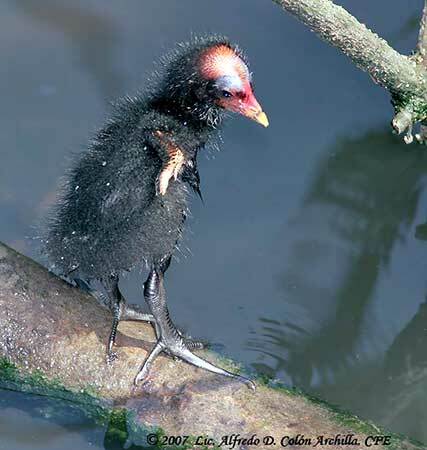 At hatching, the black downy chicks have reddish and blue bare skin on crown, yellow bare skin on throat and pink on wings. The eyes are grey-brown. The bill is orange with yellow tip. Legs and feet are black. They are able to swim very soon after hatching, and can feed themselves in a couple of weeks. They are fed by both parents during this period, and they fledge about 40-50 days after hatching. 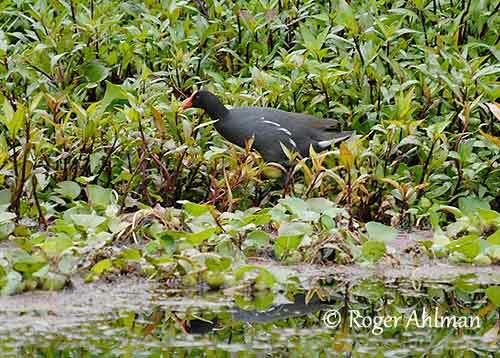 The Common Gallinule is usually abundant in most part of the range. The species is locally uncommon to abundant in Central and South America. The race “cachinnans” in North America is rare to locally abundant. The race “sandvicensis” of Hawaii is now considered Endangered. The global population was estimated to number 2,000,000 individuals in 2014. This population is globally stable and increasing in North America. 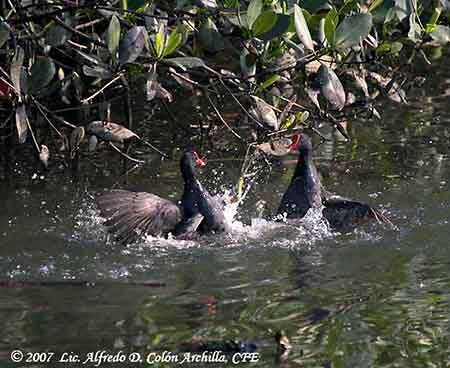 The Common Gallinule is currently evaluated as Least Concern.